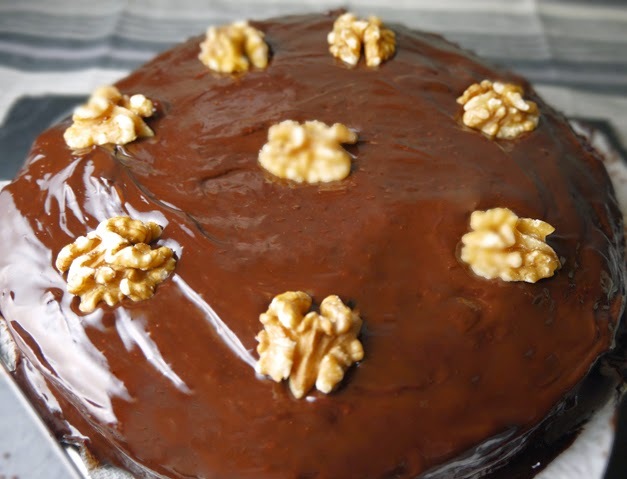 Eggless Chocolate Cake is a very tasty and yummy served as a Dessert. It is a perfect on birthday occasion or on anniversary.In this i have used a condensed milk for making this. This chocolate cake is all time favorite of kids. The cooking time of making this cake is 5 minutes and preparation time is 15 minutes. Its very easy and yummy.So enjoy this tasty cake by making it at your own kitchen. Sift maida, cocoa, soda and baking powder. Keep aside. Beat sugar and milkmaid till fully. Add oil. Beat well. Add milk and essence. Add maida. Beat well for 3-4 minutes till the mixture is smooth and light. Transfer to a greased bowl of 6″diameter. Microwave for 5 minutes. Let it stand for 5 Minutes in the microwave. Let it cool. Transfer to a serving platter. Pour chocolate sauce on in and decorate with the walnut halves or cherries. This cake can also baked at 150 c for 35-40 minutes on the convection mode.